Taking inspiration from two different versions of Alan Lee's concept for this scene, I wanted to suggest the fire-fuelled menace of the approaching Balrog and the cavernous quality of the Dwarf halls of Dwarrowdelf. Additionally, I thought creating a stony surface texture would nicely suit the deep rocky location of Moria. 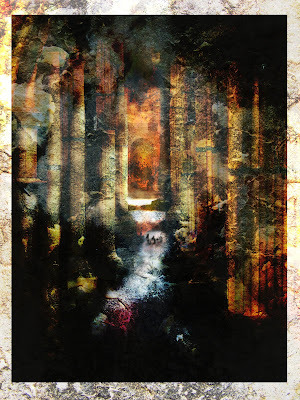 Another element that informed this illustration was Howard Shore's initial mock-up music for Moria that was written in the early planning stages for scoring the LOTR trilogy. This music and other tracks were released on a rarities CD accompanying Doug Adam's 2010 book The Music of the Lord of the Rings Films which in turn accompanies an informative blog (www.musicoflotr.com) I've been following along with other like-minded fans of the music for many years.